Blue has a home! 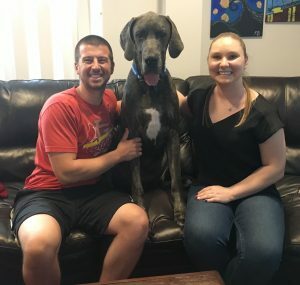 - Rocky Mountain Great Dane Rescue, Inc.
Blue has a home with his new family Mackenzie & Alec in Denver CO. This will be their first Great Dane. He will love all the attention and extra ear rubs. He will be the only pet in the home.and Alec is able to keep Blue company during the day. They plan on taking him for long walks in the parks, hiking, and anywhere they go together! We are so happy for this sweet boy!